Efficient cooling methods are indispensable for studying fundamental physical phenomena at low temperatures, leading to important discoveries such as superconductivity, Bose-Einstein condensation and the quantum Hall effect in the laboratory. As numerical tools, cooling algorithms are crucial for studying ground-state problems in computational physics, and for solving complex optimization problems in computer science. Recent advances in quantum information science open new venues for scientific discovery in physics and chemistry. However, simulating low-temperature properties of many-body systems remains one of the major challenges for both theory and experiment. In a recent work published in Nature Photonics , we developed a novel cooling method, called demon-like algorithmic quantum cooling (DLAC), that provides a solution to the problem of cooling quantum systems in a way similar to that of Maxwell’s demon. The method of DLAC share some features of heat-bath algorithmic cooling [2,3,4] and an approach of cooling that we call the dissipative open-system approach [5,6]. 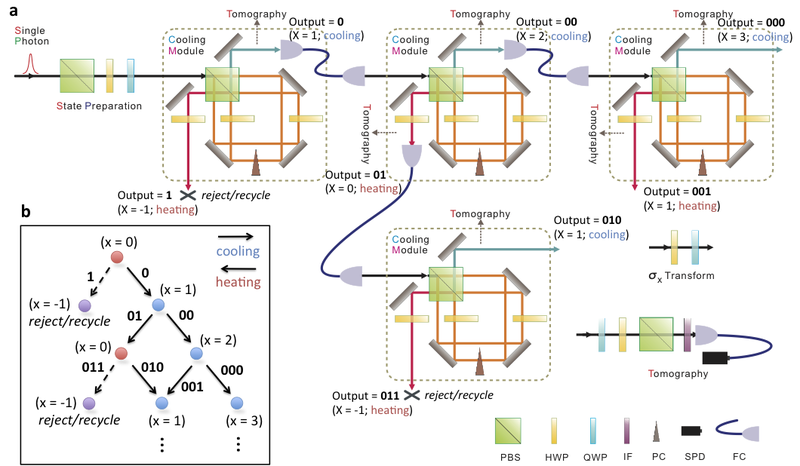 Heat-bath algorithmic cooling [2,3,4] is one way of cooling classical spin systems, which would be useful for initializing qubits in the ‘0’ state. The idea of heat-bath algorithmic cooling is to first re-distribute the entropy within a group of spins. Then, the spin (or the group of spins) containing relatively high entropy is put into contact with a heat reservoir to pump away the excess entropy. This procedure causes the overall entropy of the system to decrease. The dissipative open-system approach [5,6] aims to drive a quantum state to the ground state of a certain kind of Hamiltonians, called frustrated Hamiltonians. This approach is based on the application of appropriate quantum jump operators to the subspace of the quantum state that would give an energy penalty. Our DLAC approach is similar to the heat-bath algorithmic cooling, in the sense that the entropy of the system is re-distributed, but in a superposition of states, instead of different spins. DLAC is also similar to the dissipative open-system approach, in the sense that the superposition is collapsed once through a projective measurement of the ancilla qubit. The resulting operation is equivalent to applying a jump operator that causes the entropy to increase or decrease, depending on the measurement outcome. A more detailed analysis is shown in Fig. 1. Fig 1. (View higher resolution by clicking on the figure) Basic principle of the cooling method. (a) Logic diagram of the feedback cooling system. The cooling module produces two outcomes, correlated with heating and cooling. The measurement result can be mapped into the position x of a 1D random walker; when the walker goes beyond its starting position x = 0 to the negative position x = −1, the particle is either rejected or recycled. (b) The quantum circuit diagram of the cooling module. It includes a controlled evolution for time t and an energy bias parameter γ. (c) The relative change in the population of the output state post-conditioned with a “cooling” measurement result depends on the eigenenergy. The lower the energy, the higher the gain. The DLAC approach can be implemented in many systems such as trapped ions, quantum dots, and superconducting qubits. We chose to implement it in a quantum-optical system operated by the optics group Key Laboratory of Quantum Information of the University of Science and Technology of China (USTC). The optics group is lead by Prof. Chuan-Feng Li and the experimental setup (see Fig. 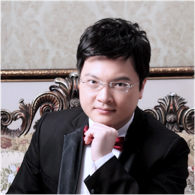 2) is mainly designed and performed by Prof. Jin-Shi Xu. The quantum system to be cooled is the polarization of a single photon. Fig 2. (View higher resolution by clicking on the figure) Experimental setup. (a) The input photon state is prepared by a polarization beam splitter (PBS), a half-wave plate (HWP) and a quarter-wave plate (QWP). The cooling module is a polarization-dependent Sagnac interferometer. Split by the PBS, the horizontal and vertical components of a polarized photon propagate in opposite paths within the interferometer. Two HWPs operate on the corresponding polarization components. The quartz plate compensator (PC) is used to compensate for the relative phase in the interferometer. These elements simulate the system Hamiltonian. Both paths are then recombined on the same PBS. The photons at output ports 0 and 1 represent the cases of cooling and heating, respectively. The photon proceeds to the next cooling module depending on the value of the position x of the random walker. The final quantum state is reconstructed using quantum state tomography, with the measurement bases defined by a QWP, HWP and PBS. The photon is detected by a single photon detector (SPD) equipped with a 3 nm interference filter (IF). (b) Sketch of the random walker evolution. In the experiment, we were able to achieve three steps of cooling (see Fig. 3) with two different strategies, namely evaporative and recycling. These two strategies determine what we do when we have a resulting state that has an entropy higher than the initial state. The evaporative strategy basically throws away those states and recycling strategy replace them with the original state. Fig 3. 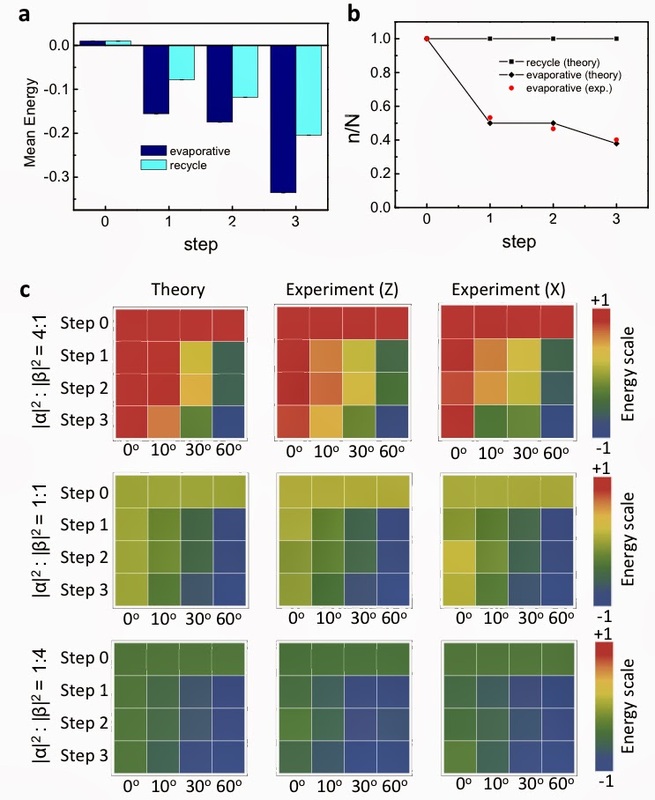 (View higher resolution by clicking on the figure) a, Mean energies of the evaporative and recycling pseudo cooling strategies. b, The corresponding theory and experiment for the number n of copies obtained out of N initial copies at consecutive steps. The total probability of the recycling algorithm is set to 1, correcting for experimental losses. c, Mean energies for 3 pseudo cooling steps of the evaporative (non-recycling) strategy for different θ. Different maps correspond to theory and experiment for Hamiltonians Pauli Z and Pauli X, and different initial states (step 0). Error bars represent the statistical distribution of experimental measurements. In conclusion, this optical experiment has adequately verified the feasibility of the our DLAC approach of cooling quantum systems. To extend the implementation of the cooling method to a larger quantum system, the key consideration is to choose a system where both projective measurement and feedback control can be efficiently incorporated. These technologies are currently not widely available, but they should become mature in the near future. For an extended discussion of this work in the context of Maxwell’s demon, see the associated News and View  by Seth Lloyd. Jin-Shi Xu, Man-Hong Yung, Xiao-Ye Xu, Sergio Boixo, Zheng-Wei Zhou, Chuan-Feng Li, Alán Aspuru-Guzik, Guang-Can Guo, "Demon-like algorithmic quantum cooling and its realization with quantum optics". Nature Photonics, 8, 113-118 (2014). Abstract. P. Oscar Boykin, Tal Mor, Vwani Roychowdhury, Farrokh Vatan, Rutger Vrijen, "Algorithmic cooling and scalable NMR quantum computers". Proceedings of the National Academy of Scienses USA, 99, 3388-3393 (2002). Full Article. J. Baugh, O. Moussa, C.A. Ryan, A. Nayak, R. Laflamme, "Experimental implementation of heat-bath algorithmic cooling using solid-state nuclear magnetic resonance". Nature, 438, 470-473 (2005). Abstract. José M. Fernandez, Seth Lloyd, Tal Mor, Vwani Roychowdhury, "Algorithmic cooling of spins: a practicable method for increasing polarization". International Journal of Quantum Information, 2, 461–477 (2004). Abstract. B. Kraus, H. P. Büchler, S. Diehl, A. Kantian, A. Micheli, P. Zoller, "Preparation of entangled states by quantum Markov processes". Physical Review A, 78, 042307 (2008). Abstract. Frank Verstraete, Michael M. Wolf, J. Ignacio Cirac, "Quantum computation and quantum-state engineering driven by dissipation". Nature Physics, 5, 633-636 (2009). Abstract. Seth Lloyd, "Quantum optics: Cool computation, hot bits". Nature Photonics, 8, 90–91 (2014). Abstract.